We Indians love our Pakoras or Bhajiyas as they are commonly known back home. Pakoras are nothing but different vegetables deep fried in Gramflour and eaten with spicy dips and Chutney’s. It is a famous tea time snack and is very popular in the rainy season with the soft and hot Pakoras melting in your mouth creating a perfect symphony with the beautiful rain. I am however not a Pakora or a Bhajiya person, I do not like the fact that they are deep fried in so much oil but sometimes I do make exceptions and go the deep fry way. So when I had half a Zucchini lying in my fridge, which was not enough to use anything else out of it, I thought making Pakoras was my best bet. Now you don’t have to wait for rains or Tea time to enjoy these sinful treats. I actually cut a Turkish Bread in half, lathered it with lots of spicy Peanut and Mint chutney and then stuffed the bread with slices of Onion and the Pakoras. Oh my god, it was a treat. I finished a whole sandwich for dinner and felt terribly guilty after it. But I guess this is why you eat such things, to enjoy them, to savor them and just relish the taste of the deep fried goodness in between soft bread with the crunchy Onions and tangy Chutney. 1) Wash and cut the Zucchini in medium sized pieces. 2) Add the gramflour and semolina in a bowl. Add the Salt, Turmeric powder, Chilli powder, Chat masala and mix them well. 3) Now start adding the water slowly mixing gently making sure that you don’t have lumps and there is a thick runny batter formed. 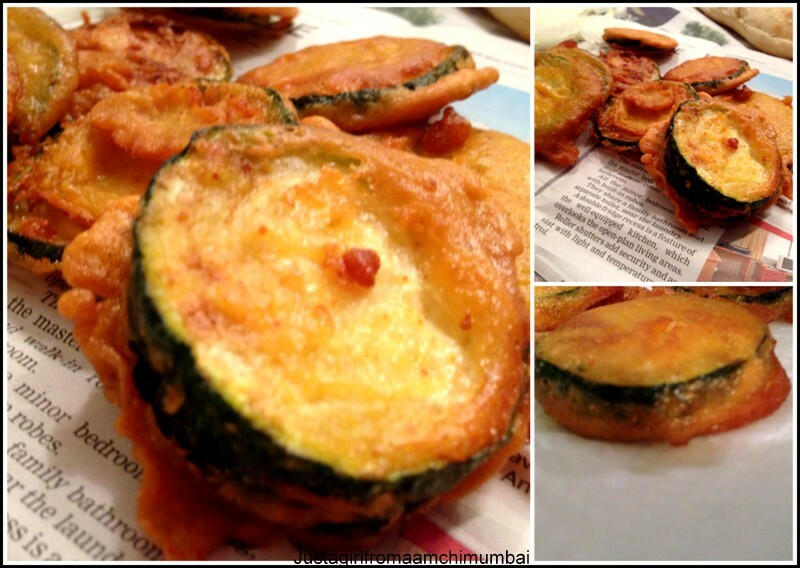 4) Add the Zucchini and let it rest in the batter for around 10 minutes. 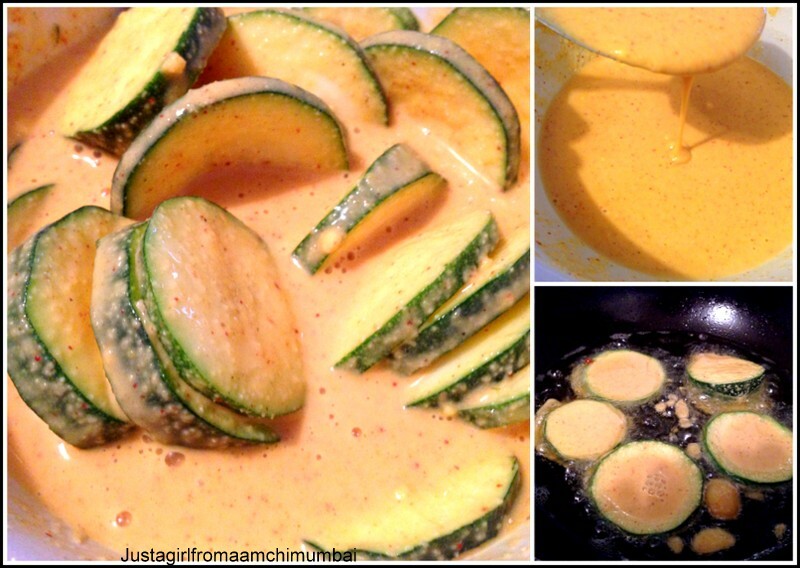 5) Heat oil in a pan and now add the Zucchini pieces, dipping them in the batter one by one. Make sure that the gas is on a medium flame as the gramflour may burn quickly without the Zucchini being cooked. Don’t add all the Zucchinis at the same time. Do a few at a time ensuring there is enough space to turn them around. 6) Once the Zucchini is browned on both sides remove them from the oil and drain on a kitchen towel before you serve them with some hot chutney or stuff them in between soft slices of Bread. Enjoy !! I would devour these in a jiffy….my idea of divine food on a rainy, chilly evening. Yeah they are perfect for rainy evenings. Lol we love out guilty pleasures no. 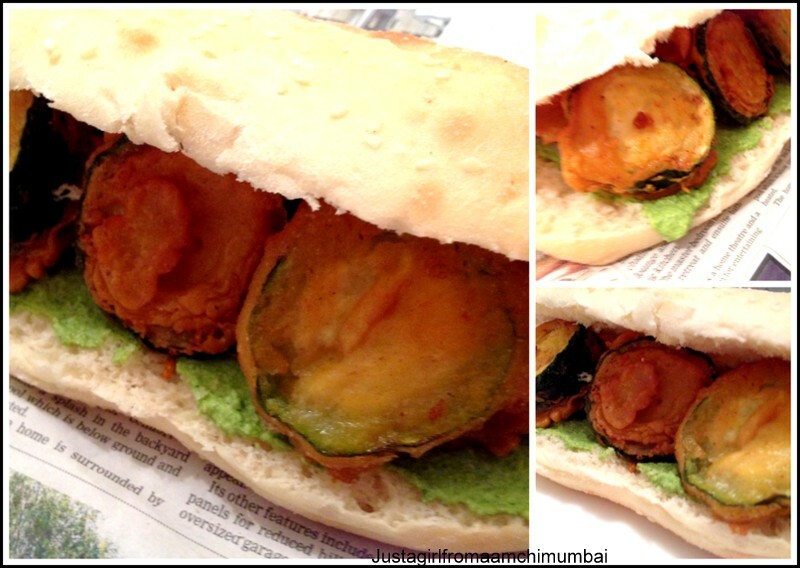 I love pakoras and what could be better than a pakora sandwich. Thanks Amy, hope you will enjoy it and let me know. This looks way too good – I think I need to try it out yum! Kristy, I can eat several of them at the same time. They are so good. Let me know how you go Kristy. Thank you for commenting. I love zucchini done this way. There is a little vegetarian cafe here in Adelaide that does them perfectly. Glad to know you enjoy it too. I will feel less guilty now.